Those of you coming late to the Ohio Donut Trail series would be well advised to backtrack to get caught up on where we are to date, the sixteen donuteries worth a mention as of March 2013 will be found in this link -> Ohio Donut Trail. For those loyalists who have followed this series, I offer a brief update. I still feel firmly that DK Diner has the best overall donuts of all of those sampled so far. As for second place, I struggle a bit. Perhaps it is Bill’s in Centerville, Auddino’s near my home or Donald’s Donuts in Zanesville. There is much work left to be done. While I have covered most of the better donuteries south of I-70, I have yet to sample any of note in Northern Ohio. I do have list of at least four more donut shops to try before I make a far-reaching, final decision on what is the best of the bunch. On a related note, there is a change in the culture of donuts that has occurred over the last few years, and I will be writing about that in great detail soon so the donut trail series will serve as a fine primer for you. I found Stan the Donut Man on a fluke. I was making my annual Dayton Daytrip to visit a few of my favorite places there: El Meson, Ester Price Candies, Bill’s Donuts and Dorothy Lane Market. 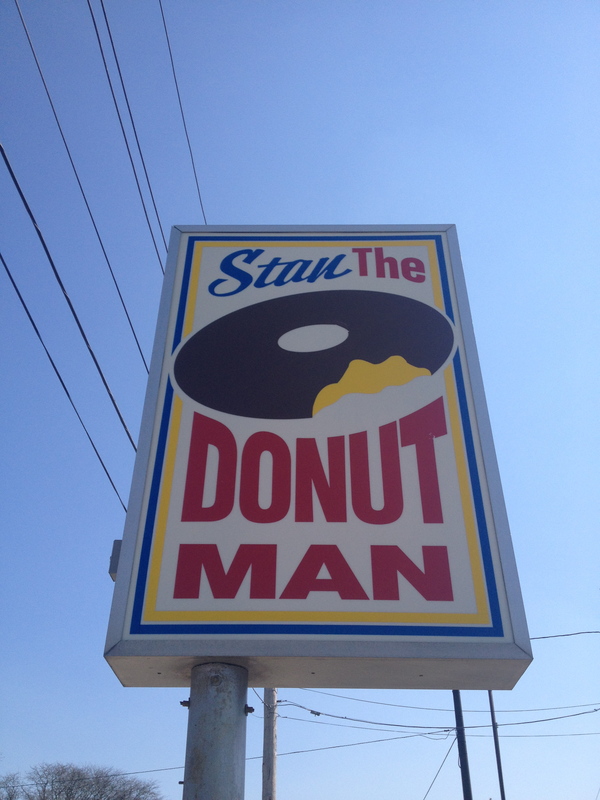 While making an itinerary change to head to Bill’s, I caught Stan the Donut Man out of the corner of my eye. I hit the brakes and glided into the parking lot like I had planned it. I could tell by looking at the exterior that this place had a enough character to make it likely to be good donut destination. What are the signs of a potentially good donut spot? It looks old, maybe a bit run down (check). It looks like it was built sometime between 1930 and 1960 (check). It says donut not doughnut (check). When you walk in there is an older gentleman sitting at the counter with the appearance of sitting there most of the day, everyday, for last least a decade (check). Yep, things were looking promising as I approached the door. On the downside, it was late on a Saturday afternoon and there was just one small tray of miscellaneous donuts leftover from the customer orders of the morning. I thought I may have missed the donut bus. 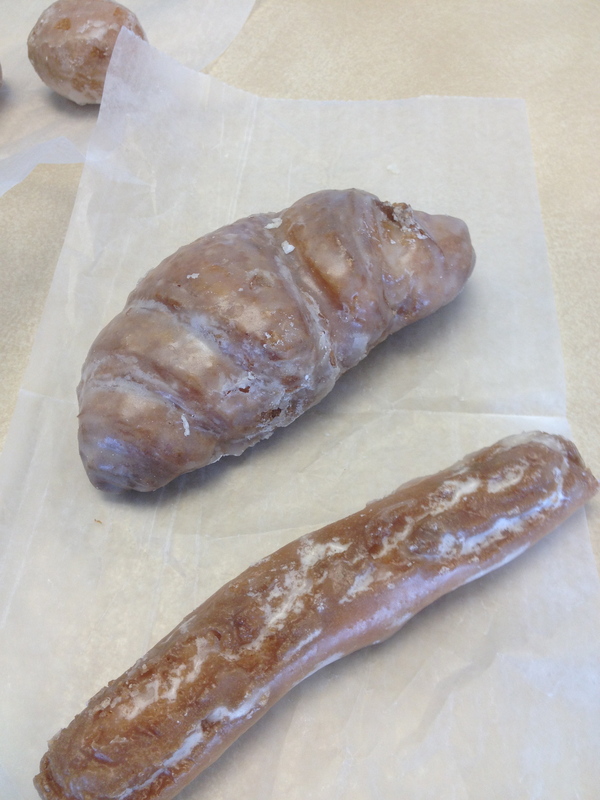 Among the few donuts left, I spied a glazed croissant. For those of you familiar with my study of the donut sciences, a glazed croissant, sometimes known as a dosant or cronut, is a prime indicator of the practice of advanced donut production. I was a bit wary of the place and had planned just to pop in to get one donut to sample for consideration of future in-depth study but once the glazed croissant was sighted and acquired, I went into full investigatory mode. Unfortunately for my designated diner, this meant some significant sampling sandwiched in between Esther Price Candies and Bills donuts. The man behind the counter sensed my passion for his trade and he had empathy for the fact that there was little left for me to try. To help with my decision-making, he gave me a free sour cream stick and a few donut holes to try out while I plotted out which donuts to try among the survivors of the day. The long narrow sour cream sticks were something I had not encountered before. The donut holes were yeast donuts and had clearly been out for a few hours but they tasted great. In the cake vs. yeast donut debate, I am firmly a cake donut man, but I would drive a few extra miles for these yeast donut holes. The glazed croissant was very good. The other donuts sampled, which transpired 3/4’s of a day later, were still fresh and tasty. I did not get a chance to sample enough of their line up to place Stan’s in the top seven donut spots to date, but with a few more exhibits for consideration, I think it would be a contender. There were a few other observations indicating Stan’s stands tall among it’s Dayton area donut peers. 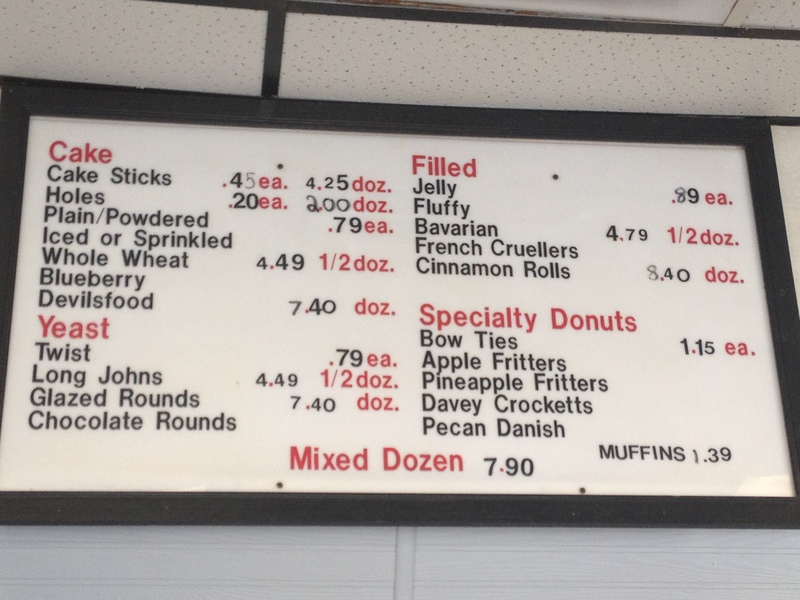 The small selection of specialty donuts features regional classics: Davey Crockett’s, Bow Ties and the very rare Pineapple Fritter. As an aside, the presence of a few wooden stools, well-worn by time, is always a prime indicator of potential donut greatness. Stan’s is about 2 miles away from Esther Price Candies on Wayne Ave. With a quick cut over to Far Hills Ave, you are near Dorothy Lane Market and a quick crossing of 675 over to Centerville, Bill’s Donuts. If you are so inclined there is a LaRosa’s pizza near Bill’s creating a regional iconic eatery tour all within a short distance of each stop. I suggest you take a cooler, some bottled water and take a few breaks to stretch your stomach muscles in between. 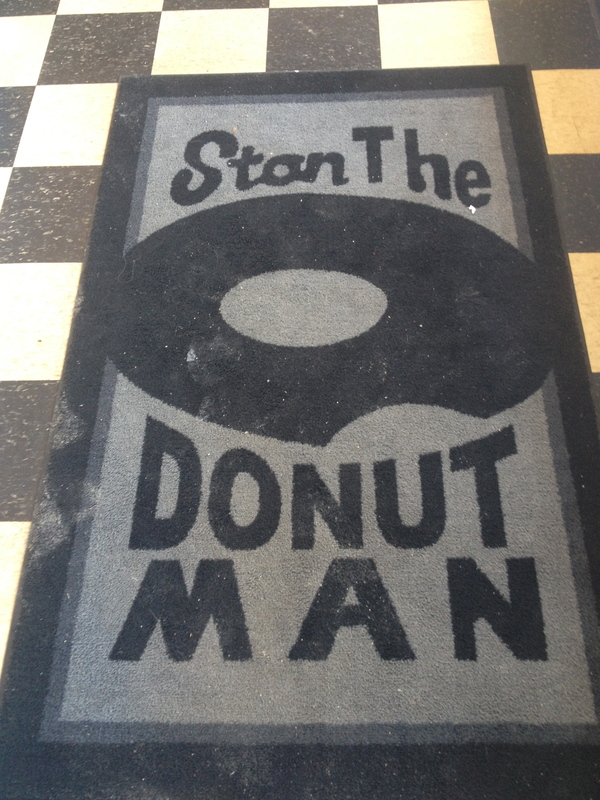 There is another Stan The Donut Man in West Chester, Ohio (I found this in a Google search, but I do not know if the two locations are connected). This entry was posted on March 31, 2013 at 10:16 AM	and is filed under donuts, Ohio, Ohio Donut Trail, Road Trip. Tagged: Donutery, ohio donut trail, Stan the Donut Man. You can follow any responses to this entry through the RSS 2.0 feed. You can leave a response, or trackback from your own site. Did you know Saveur magazine has named Bill’s Donut Shop at 268 N. Main St. in Centerville one of the “50 Finest Donut Shops in America.”? Yes. And that Saveur issue will be part of my upcoming look at the rise of donut culture. Don’t get me wrong, Bill’s is really good, but their listing in Saveur was based on Jan and Michael Stern’s very limited and not so recent forays into Ohio. If they spent more time in the Buckeye state I think 1-2 shops would have gotten a mention as well. Replace LaRosas with Marion’s Pizza and you have a great all Dayton trip. Marion’s – a truly Dayton style pizza. I like it a lot, some others don’t. A good suggestion. Other places would include the Pine Club and Christophers. Just sent my vote for my favorite blogger…hope they let a st Louis vote slide though! If you want an apple fritter, which is my favorite donut, visit Hidden Valley Fruit Farm located just south of Centerville on 48 during apple season. 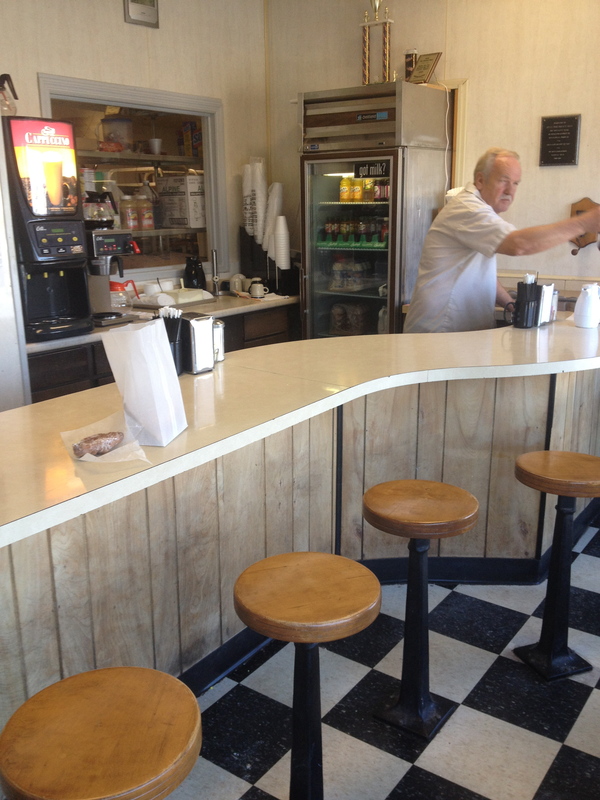 Next time you’re in the area, make sure you stop into Jim’s Donuts in Vandalia!